NO RESIDUE - don't you hate it when eyeglass holders smear a film on top of your lens, making your glasses hazy and foggy? Holdee uses a soft & short liner that protects yet keeps your lens 99% crystal clear. NEVER MISPLACE YOUR GLASSES AGAIN - with Holdee, your glasses will be easy to find and always within reach. No more frustration. No more panic. GREAT GIFT - one for every spot: nightstand, kitchen counter, computer desk, office, bathroom, den. MODERN DESIGN - modern and professional Tip-Proof design will match any decor for people of all ages. PEACE OF MIND - maximum protection for your expensive eyeglasses. No more scratching, nicking, bending, or getting dirty. Holdee will also protect your glasses from your cat. This is a very convenient and useful product. I keep the HOLDEE Eyeglass Holder right by my computer so I'm able to keep my glasses close by. The base is wide enough to keep it sturdy and it doesn't tip over. 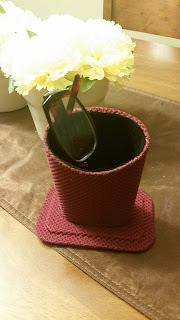 The outside has a nice design made from a soft fabric and the inside is like a velvet like fabric to ensure your glasses do not get scratched up. 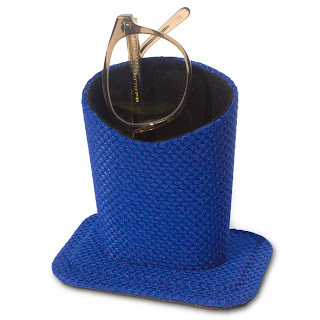 The bottom has the same velvet fabric, which helps the holder not slip and slide on a desk or table. I believe the cup itself is big enough and deep enough to hold any type of glasses. The picture is pretty accurate with how much a pair of glasses will stick out. I have also put this holder next to my bed on the night stand so when I go to bed I can easily put them in for safe keeping. Overall, I really like this product. 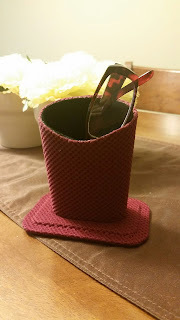 Even if you don't wear glasses, you could even use this to hold your sunglasses. 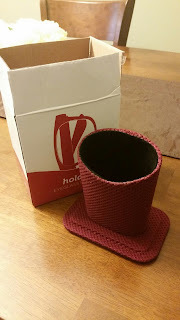 If you would like to try this for yourself, you can purchase this HOLDEE - Eyeglass Holder - Never Lose Your Eyeglasses Again right now from Amazon!